Welcome to the neoSelvas Project website! About this project… We are studying the process of secondary forest regeneration after former agricultural land use. Independent studies conducted in Central Amazonia (Manaus, Brazil), northeastern Costa Rica, and Chiapas, Mexico reveal that observed vegetation changes within forests often deviate from predictions based on single-time studies of forests at different times since establishment. 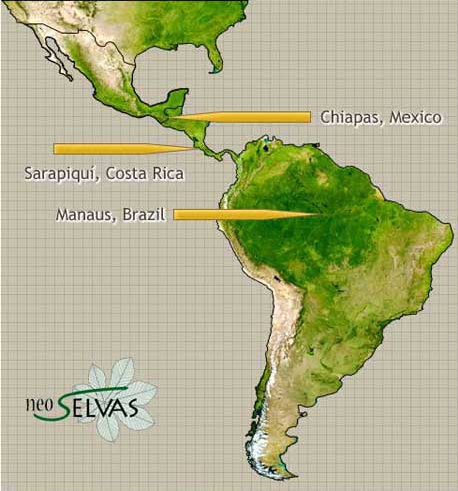 This project unites four existing projects in wet tropical forests of Latin America. Since 2012, we also include projects on successional dynamics in dry forests of Oaxaca, Mexico and semi-deciduous forests of Boliva. Coordinated annual vegetation censuses in long-term study plots are being conducted to test the validity of chronosequence predictions for a range of dependent variables. Our collaborative project began in 2007 and is funded for 10 years by the US National Science Foundation.